Toby Stephens takes us back to the world of cunning, adventure, mishap and fun. 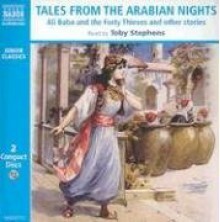 Sheherezade, night after night, weaves her tales and Aladdin and his Magic Lamp, Sinbad the Sailor, Ali Baba and the Forty Thieves and other tales come alive. The unforgettable music of Rimsky Korsakov sets the scene perfectly. A delightful treat for young listeners. Not a bad series. This one didn't include certain stories, but I had them in a different one.